Anastasia Beverly Hills Soft Glam Eye Shadow Palette | Review & Swatches! 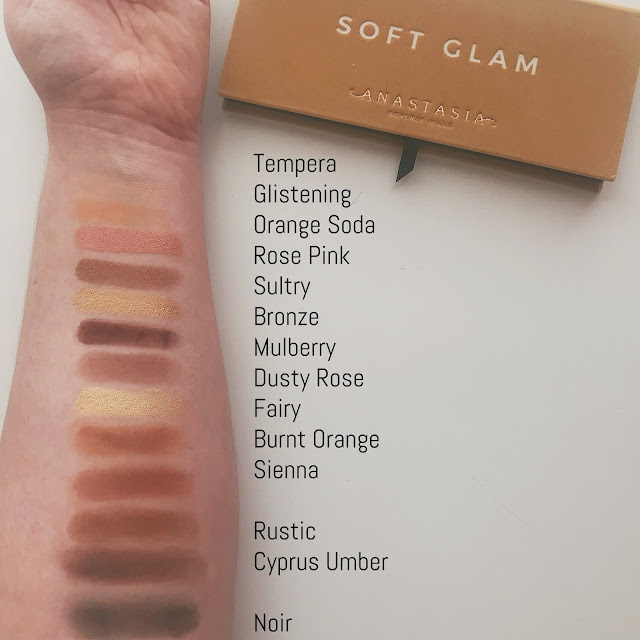 As I began to prepare myself to purchase the new Norvina palette by Anastasia Beverly Hills, I realized that I have yet to mention the Soft Glam palette by Anastasia Beverly Hills on my blog! This is insane to me because the Soft Glam has been one of my favorite palettes, and this palette has been my most used out of my collection since I purchased it in March! So, I decided to quickly roll out this blog post so you all can see just how beautiful this palette truly is. When this palette first came out, I knew I just had to have it. I was a little hesitant because I do own the Modern Renaissance palette and I was worried that these two palettes would be too similar. I also knew, that the formula was the same for both palettes, and I really did love the Modern Renaissance Palette so this fact did persuade me into buying it. Both palettes do have three of the same shades which are Burnt Orange, Tempera, and Cyprus Umber. Other than that, these palettes are very different. The Modern Renaissance palette has more mauve colors while the Soft glam has a larger selection of brown shades. The Modern Renaissance is more of a daring palette in comparison with the Soft Glam palette. If you are looking for more of a pink hint in your eyeshadow collection, then I would go with the Modern Renaissance palette. But, if you are wanting golds and browns, you NEED the Soft Glam palette. The colors are very pigmented! If you know me, you know how important this fact is to me. I cannot stand when I splurge for a palette and the shades are not true to color or there is not a ton of pigment. Trust me, I have been deeply disappointed over products I thought were going to be fantastic and had great reviews. This wasn’t one of those cases. The colors are very beautiful and, for the most part, match the color of it’s shade in the container. When I used the Soft Glam palette, I was able to go all day without this eyeshadow smearing or creasing. I use the eyeshadow primer by Too Faced called ‘Shadow Insurance’ and it is honestly the best eyeshadow primer ever. For the most part, it helps reduce the creasing of my eyeshadow. That being said, I have oily skin and some eyeshadows tend to still crease even if I use this primer. The Soft Glam palette, however, went a whole 12 hours without creasing and without needing to be touched up! I don’t know what this formula is, but my eyelids gets along with it! The final reason this palette quickly became a favorite of mine is because there is barely any fall out and the shades are so easy to blend! Of course the deeper shades do have some fall out as do all deep shades, but the amount is very small compared to most palettes. And, the fall out was none existent for the lighter colors. All of the shades work together perfectly and blend nicely without the shades looking basically the same as the next shade in the palette. I deeply do adore this palette and highly suggest it to anyone on edge of purchasing it.